May | 2014 | Brand On! Want a private social network just for family members? Hub is built for this. It is available as an app for iPhones and Androids to help keep you and your family connected and organized. 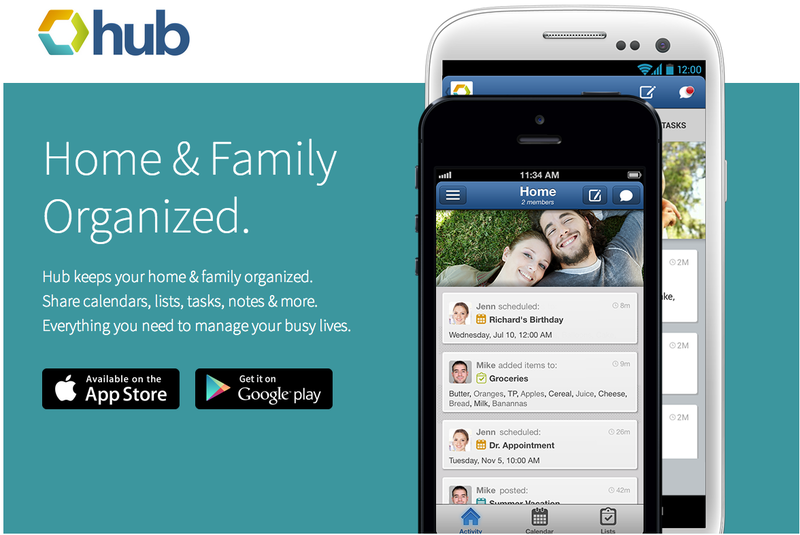 Use Hub to share calendars, lists, tasks and private messages. Another similar solution for families (or anyone wanting a private group, like a conference or company) is Glassboard. It’s also available for iPhones, Androids and the web. I love the feature that lets you click on a phone number on your Mac and instantly dial it on your iPhone. You can also send Google Maps directions from your Mac to your phone, and they will open in your preferred Maps app. Slick! 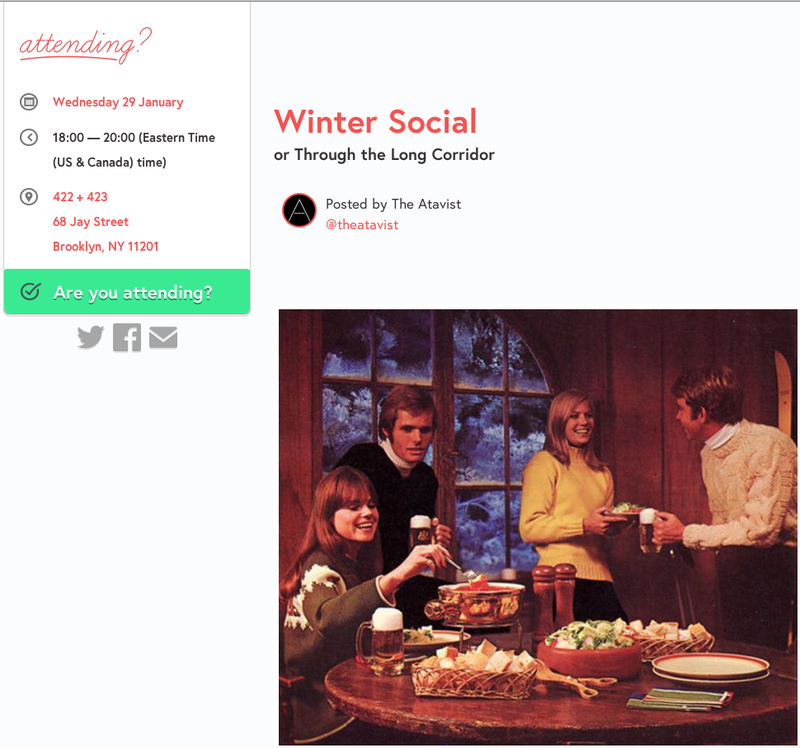 Make a simple RSVP page for your event with Attending.io. You’ll need a Twitter account to sign in. Then, simply create and share your event. You can use the Markdown language to add formatting, links and other elements, along with things like a hashtag and an invitation for guests to join your newsletter. 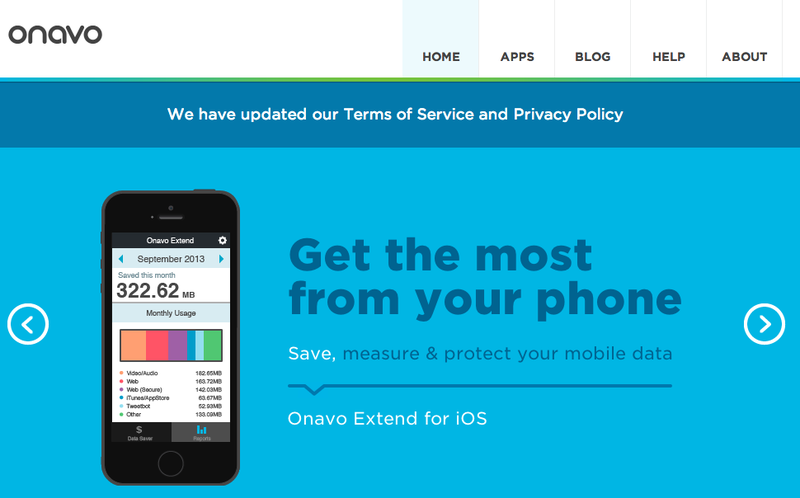 Onavo Extend is one of those must-have apps for anyone using an iPhone or Android phone. It compresses data (including images and text) to help you get more out of your plan. The company claims you will get up to five times more out of your 3 or 4G data plan without changing the way you use your phone. Keep using your favorite apps, sharing photos and browsing the web—but with less “dings” against your monthly bandwidth limits. If you want a better way to remind clients about upcoming appointments,JustRemindIt is an excellent system. 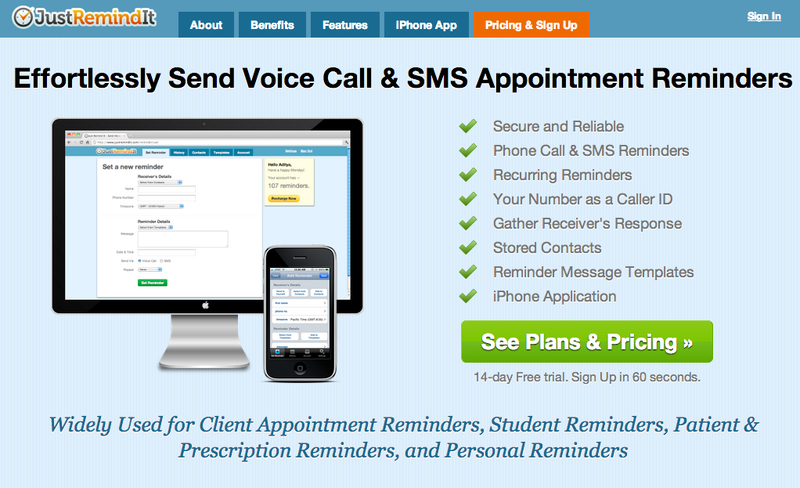 It let’s you schedule and send automated reminders by voice or text message. All you have to do is enter the recipient’s name, phone number and timezone. Then enter some reminder details by simply typing a message and setting the time you want to send it. You’ll have the option to select either Voice Call or SMS. You can speed up the process using templates or by setting recurring reminders. They also have an iPhone app to make it easy to set up and send reminders on the go. Cost: There is a free plan that provides five free reminders per month; small business plans range from $9.99 per month for 65 reminders, $19.99 for 150 reminders or $39.99 for 350 reminders. The business plans let you create custom greeting messages, show your company’s phone number on caller ID and send repeat reminders to the same clients. By now, you may already know about Rapportive. It’s a great addition to a Gmail account (or Google apps email). 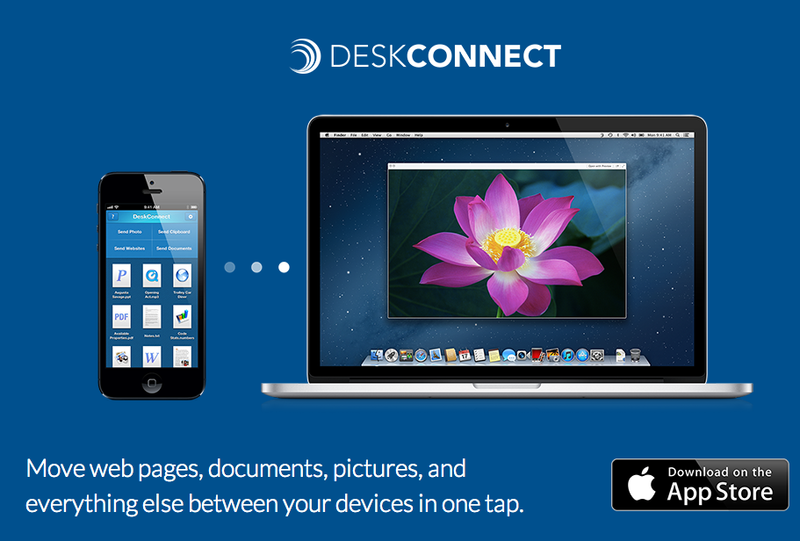 At a glance, it will give you links to your contacts’ social media sites and even a few of their recent updates. 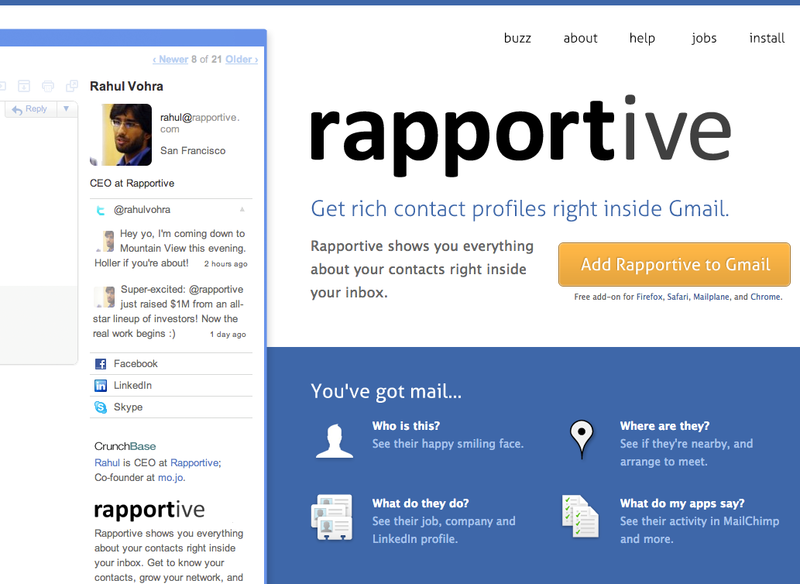 But what I really love Rapportive for is its slightly-hidden secret in helping you discover virtually anyone’s email address in minutes. If you are in sales and marketing (who isn’t? ), this is invaluable, since getting to someone’s inbox directly can be golden. Basically, whenever you start to type an email in Gmail, if the address is a “match” in Rapportive, you will instantly see their information in the sidebar. That’s great, but how do you find out someone’s email in the first place? You could attempt to guess it, but that is hit-or-miss and time consuming. The fastest and best way I’ve found is to use a killer spreadsheet called an email pemutator, together with Rapportive. This allows you to quickly generate a bunch of potential combinations of someone’s email address, which you then plug into Gmail to validate. Rather than explain this in detail, read this comprehensive blog post from Distilled. Just follow the directions (watch the video) and click the link to get the free Google Doc spreadsheet that you’ll need. I promise, this stuff works like magic. But as they say in the post, “With great power comes great responsibility.” You wouldn’t want to use this to spam people, and you better have a great reason to email someone out of the blue who doesn’t know you!